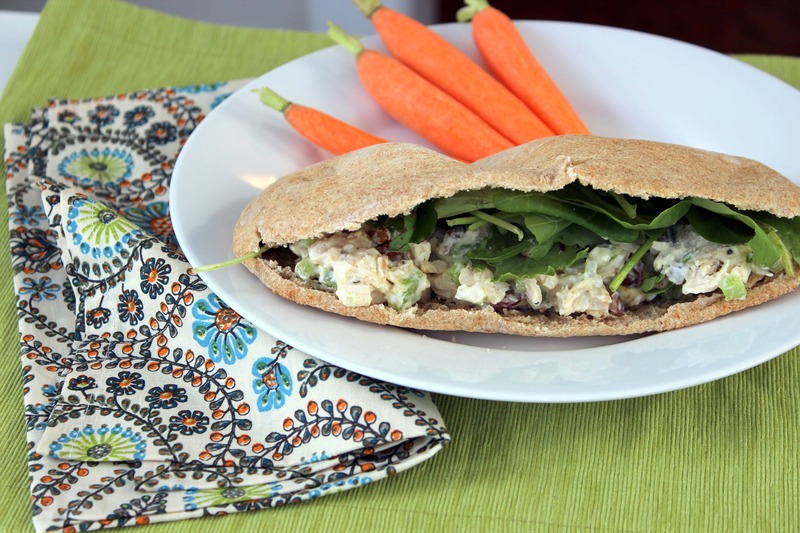 This Healthy Chicken Salad recipe is a delicious and nutritious twist on the classic. Mayo free, too! Start with the chicken in a small bowl. Add chopped celery, grapes, and a small handful of walnuts. Mix it all up, place on a whole wheat pita or bread , cover with spinach, and enjoy!! This would also be awesome with dried cranberries instead of grapes. Wow!!!! This is SOOO good!!! I just had it for lunch, but with a few variations. I didn’t have any grapes, so I used dried cranberries. I only had a tiny bit of celery left over from yesterday’s salad, so I also put in some cucumber. I wanted to use up some quinoa, so I put in half a cup with it instead of using a pita. I hate mayo, but love all these ingredients! I’m so glad you shared this post! I have been looking for a delicious chicken salad recipe, and I think this recipe looks just perfect! So glad you liked it! :) And thanks! Amazing recipe!! Thank you for sharing it! Great recipe – thanks. Made it yesterday and also added a few chopped green olives and some lightly roasted pumpkin seeds. But I loved the idea of walnuts and grapes – that works so well. Yum – love the olive and pumpkin seed idea!